and a Happy Friday as well!!! 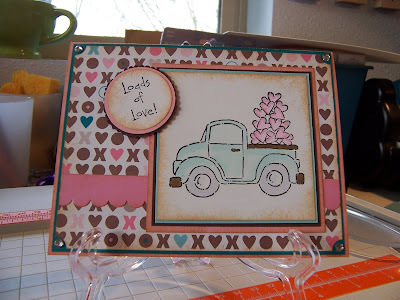 I don't think I've mentioned that I'm taking Julie Ebersole's Simply Great Card Design class over at My Creative Classroom. This class ropcks! Not only is Julie an awesome teacher...I've had the opportunity to take a class from her in the past at A Muse in Seattle...but the class she put together for card design is super! We're only in the second week of class and it has already made a HUGE difference in how I'm looking at my card making. If you get a chance I definitely recommend taking this course. Five stars all the way!!! Ok...here goes. I'm listing more for sale! 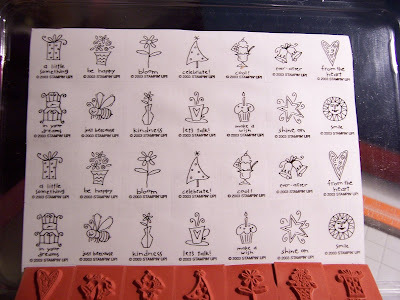 I've gone through my stamps again and these have made it into the pile. Many have never seen ink, some are new unmounted, some mounted but never used and some have seen some lovin'! I will accept Paypal and will send your package via Priority mail. A Flat Rate envelope is $4.60 and usually holds one stamp set, a Flat Rate box is $8.95 (prices listed are for the U.S.). Your stamps will be sent out once payment is received. If you are outside the U.S. postage will be computed individually. Pictures of these sets should be available in the Gallery over at SCS…try here. If you'd like to see a picture of the actual set, let me know and I can get one posted. If you're interested in any, send me an email or comment here to let me know so I can set it aside for you. Thanks for looking! *sold* Small Talk (NUM) $20 *this is a set of 28 mini stamps that demos can purchase to use as gifts, etc…I no longer have use for these and want to pass them on* ETA: I've added pictures of this set to this post, you can see them below. Anyway...back to the card! I pulled out my SU designer paper, I can't remember the name of this paper pack, but I love it! I should have picked up another pack while it was still current. Oh well, such is life. I know there is other paper out there that I will love as much! To color in the truck I used my Copics. The blue is actually just one color. I colored over and over again to gain the shading effect I was looking for. Not too bad for a beginner! 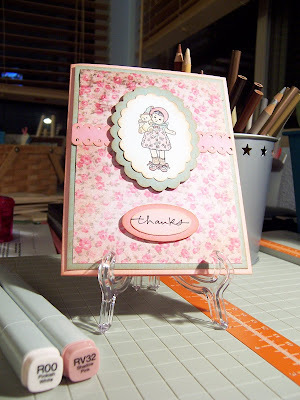 The fun little pink paper strip is from Doodlebug. I love there Paper Frills. I got mine from A Muse...I'm sure they are available at other places too. Here's the card I made for Jeff's birthday. He is bigtime into baseball! As well as softball, soccer...sports in general! 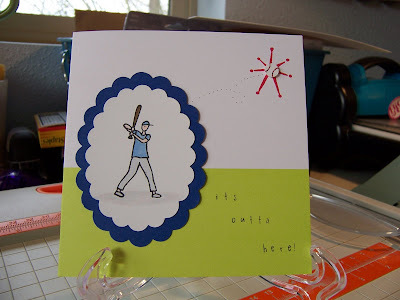 This was a fun card to make, the little baseball took the longest to make. I probably went through about 5 or 6 before I got to this one! To make the little baseball I punched out the circle using a 1/4" cicle punch on white paper. Then I punched another one to use a my guide for applying the red "stitching" on the baseball. This is the part that took me some time. At first I was using the wrong kind of marker...Copics do not work well for this! They kept bleeding onto the paper. I ended up using my real red marker from SU. This worked quite well for making a fine line with no feathering. After I got the red lines on, I added the black stitches with a very fine black marker. I think its a Millenium. I chose blue because it's not only masculine, but just happens to be the color of DH's baseball team...go Brooklyn Dodgers! If you look closely, you'll see the ground that the baseball player is standing is not perfectly grey. I meant it to be this way...so that it would resemble the dirtiness of home plate! I did this with a mix of using a light grey shadow marker and a beige one to get that "dirty" effect. Check it out...there is no greater One than this! He is Savior of all, friend, deliverer, strength, peace, wise council, shoulder to lean on, almighty, generous, kind, ever-loving, victorious, healer, confidant, mighty, everlasting...He is Jesus Christ. And it's my anniversary too! Jeff and I have been married for two years, it's been a great time! This last year we welcomed Bella as well, as many of you know. 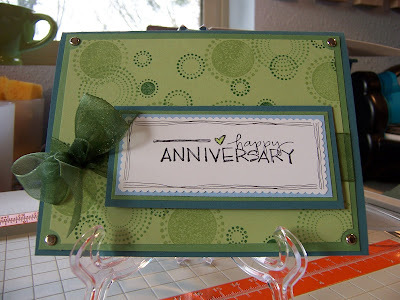 I could go on and on about her, but I'm here to talk about Valentine's and my anniversary! The Valentine's card I made for Jeff (hope he's not peaking in on my blog right now!). I went through my patterned paper and found this fun one. I love the print and design of it. Something about these kinds of papers always draws my attention...the definitions and words grab me. When I first saw this paper I immediately thought of red, black & white! Simple color scheme, but how perfect for Valentine's? Then I thought of how fun it would be to put the little gator from Wild About You with it...kinda like he's fiercely in love with you or something like that, you know? I know, this little guy doesn't look mean at all, but he's filled with love! I'm so excited for this evening! We are going to dinner at Daniel's Broiler...yum! They have the best steaks...filet mignon here I come! I am feeling so good...I feel like I've found my stamping style! For so long I've not been sure of what my "style" is exactly, or how I would describe it. The last couple days I've been in a really good groove and making cards left and right! Today I made 3 cards...for Jeff's Birthday, Valentine's and our Anniversary. I am really happy with how they all turned out. So you wonder what my style is? Well, I think it is twofold...simple and classic...and layered and embellished (I guess that's what I'd call it). 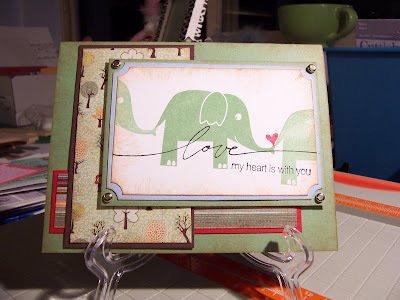 I've been so inspired lately by Kendra aka scrapstampindiva at SCS. I love her work!!! What a talented gal she is! Anywho...I was looking at her cards a couple days ago and was inspired to create some cards ala Kendra. Let me tell you, I an so happy with how they turned out! It spurend a whole card making spree! Don't you just love A Muse images? They are some of the cutest little stamps out there! And there sentiments...don't get me started!!! I have had this idea floating around in my head for some time and I finally got around to giving life. Don't you love it when what you're creating turns out how you've pictured it in your head? That's how this was! 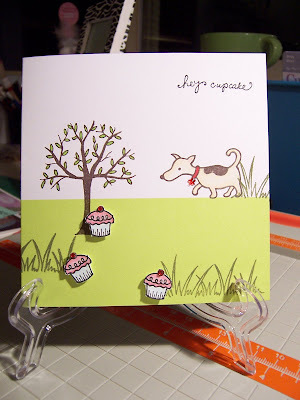 I wanted to have the little dog sniffing for the cupcakes...like he was on the trail of them. I'm pretty happy with how it turned out. On another note, I'm seriously thinking of starting a webstore to sell some of my creations and crafts. I'd have a lot of the same things available as I do at my craft shows. What I'm thinking is that I would add the store in with my blog. I'm still mulling over all the details right now. I'd love the hear some great ideas for a store name. I have some I'm thinking about right now, but more heads are better than one! If I pick a name you suggest I'll send a little goodie package your way! I'm also thinking about having a store to sell the doll clothes that my mother and I make. We have a variety of dolls that we sew for. We make doll clothes for American Girl dolls as well as selling shoes for them. In addition to the American Girl we also sew for a cute little doll named Riley Kish, you can see her here, and then we've also been recently sewing for Ball Jointed Dolls. These are a fairly new doll to the whole doll scene. These new style Ball Jointed Dolls originated from Asia and have become the latest craze in the doll world. Here is a sampling of some BJD's. A couple more random thoughts...has anyone else noticed that some of the posting options have disappeared,or is it just me? I don't see the option to change the color of text or to change the size. I know that some of the other toolbar options seem to be missing. Hope you're having a spectacular week! I have some fun news and a neat little project to share with you! A little while back I was approached by Donna at K&A Diecuts to do a bit of guest designing for her! I was super excited to be asked and of course I said yes!!! She has a neat twist to her business, at least I think so! Everyone loves die cuts right? 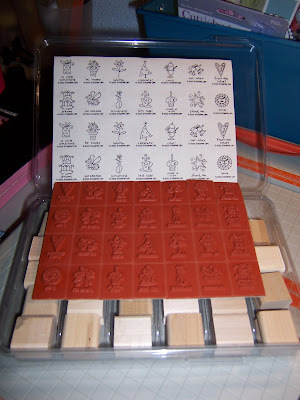 Well, since not everyone can afford a die cutting machine and all the great dies to go with it...I mean, how many different dies are out there? 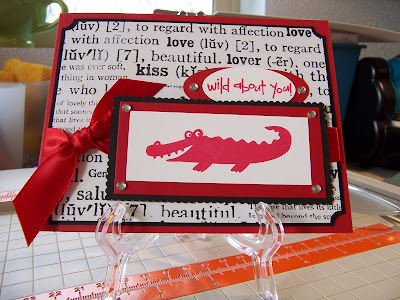 Hundreds?...she offers the die cuts for sale...no cutting or hassle involved! And the prices seem pretty reasonable to me. I know that I personally get a little tired of die cutting when I have a ton of one thing I'm trying to make up. Isn't is so much easier to just get them pre-cut and all you need to do is put them together and add embellishment? The majority of dies that she has are boxes, purses and things such as that. Well, she sent me an assortment of different diecuts to work with. The first thing I decided to make up was this cute little matchbox. I used my PaperTreyInk Holiday Treats set...such a fun set! The scalloped was made using my Marvy giga and mega scalloped oval punches. The blue stars were inked using Versamagic in Aegean Blue. I also used Colorbox Cateyes in Cranberry and Ice Blue. The ribbon around the box is red grosgrain over light blue organdy. Inside the matchbox I put four Hershey's Nuggets and wrapped them in Avery labels stamped with the Holiday Treats polka dot stamp. There are so many cute things you could do with these! Wouldn't it be neat to make some up for Easter and put little treats and goodies inside them and hide them along with the Easter eggs?